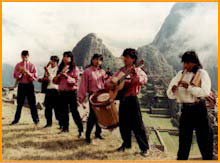 Apu's musicians all studied at Cusco's Academy of Music in Peru. A unique mix of old and new Andean compositions, breathtaking pipe and flute skills, searing samba and spellbinding rhythms. Apu’s musicians all studied at Cusco’s Academy of Music in Peru. A unique mix of old and new Andean compositions, breathtaking pipe and flute skills, searing samba and spellbinding rhythms. One of the top Latin American acts around, this band from the ancient Inca capital of Cusco, in the ‘Sacred Valley’ of the Andes, have developed a powerful and exciting mix of traditional and modern compositions. They combine breathtaking pipe and flute skills over searing Latin American rhythms, producing an inspiring and hauntingly beautiful experience…’Dirty Dancing with pan-pipes’. The three Puente de la Vega brothers formed Apu in 1983, touring Peru, Bolivia and Argentina, before relocating to the UK in 1989 following an ‘Incantation’ tour. They have been joined by their contemporaries from Cusco’s College of Music who have all played their traditional ‘Music of the Sacred Valley’ since childhood. Apu perform annually at major UK venues and festivals including the Barbican and the Royal Festival Hall in London, Edinburgh, Manchester and Aberdeen festivals. They were engaged by the Arts Council of Great Britain to launch the ‘Arts Without Frontiers’ conference and have performed everything from a concert series with the Northern Sinfonia Orchestra to an orchestral collaboration for television featuring ‘Traditional Andean & Northumbrian Folk Songs’. “The power of the sound produced held row after row spell-bound. The energy and enthusiasm of these musicians was intense. Numbers accelerated until they exploded with appreciative applause”. Edinburgh Festival Times. UK TV appearances include:- ITV’s ‘Michael Barrymore Show’, ‘The Television Awards’, ‘The Clive James Show’ and ‘Euro ’96 Football Championships’; BBC’s ‘What’s That Noise’ and ‘Pebble Mill’; Sky TV’s ‘The Gypsy Kings of the Andes’, Films include:- ‘Women in Tropical Places’ Channel 4, ‘Apu-Dancing with the Inca’ Frantic Productions & ‘The Cross Culture Series’ Hawthorne TV. BBC Radio features include ‘The Music Machine’ Radio 2, ‘Chris Searle’s Pick of the Week’ Radio 4, ‘Ruscoe on 5’ Radio 5, ‘The Julia Hankin Show’ Radio Newcastle. For certain dates APU may be augmented by top Latin American instrumentalists.